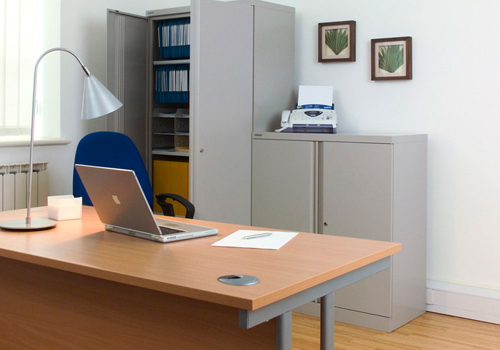 Radius Office Furniture offers a vast selection of steel cupboards for sale. Metal storage cupboards create strong, industrial style in the workplace, whilst also offering useful storage space. They are also suitable for warehouses and garages because of their sturdy and durable structure. These cupboards are ideal for a wide range of purposes, from sorting paperwork and files to holding equipment and stationery. If you’re looking for a storage solution that helps you to stay neat and tidy in the office without compromising on style, stainless steel cupboards are the ideal option. Their minimalist, industrial appearance works perfectly with forward-thinking office environments and is also well suited to more industrial areas, such as factories. Our online catalogue offers a wide selection of styles and sizes to best suit your needs. There is a selection of different shelving levels. The shelves can have up to 5 levels making it a highly efficient and economical storage system to accommodate for multiple requirements. The shelves incorporated in our range of steel office cupboards are adjustable, giving you instant flexibility and control. You have a choice of a two-door steel storage cupboard or a sliding door mechanism to suit your preference. 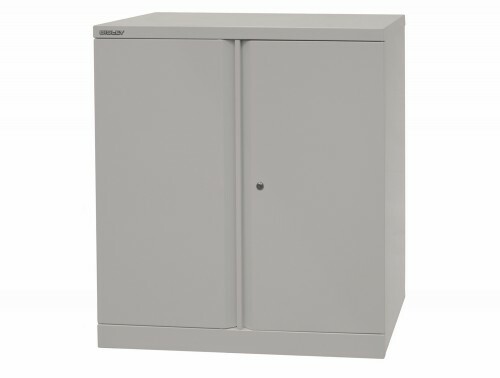 A selection of our heavy-duty steel cupboards for sale are fully lockable, an ideal office storage solution for those with confidential or valuable items in the office. For colour finishes in our metal storage range, you have a choice between black, grey, brown and cream. 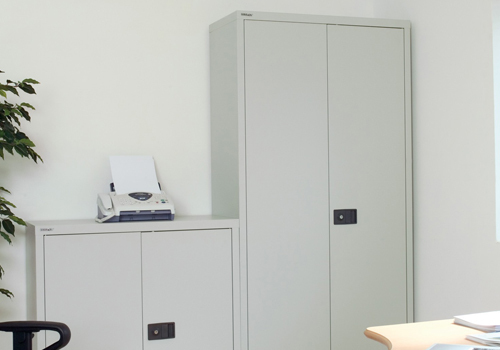 Radius Office Furniture’s range of steel cupboards are designed to be practical, hard-wearing and durable. 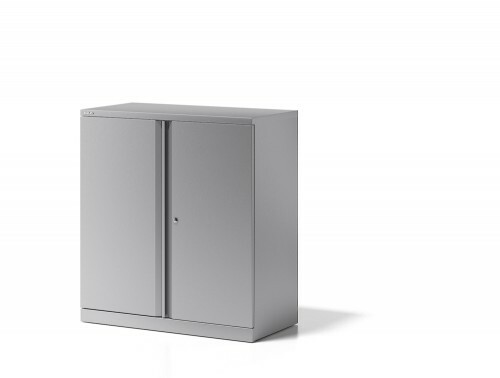 We source our metal storage cupboards from some of Europe’s most reputable furniture manufacturers such as Steelcase, Buronomic, Trexus, Bisley, Vinco, Ashford and Oplan. Sourcing from these highly trusted manufacturers helps us to guarantee that when you invest in one of our steel storage solutions, you know that you’re getting a high-quality item. A variety of our steel storage comes with a warranty, which means its functionality is guaranteed during that period of time. Products have also been rigorously tested to make sure it is of the highest standard fit for either a home office or a corporate office. 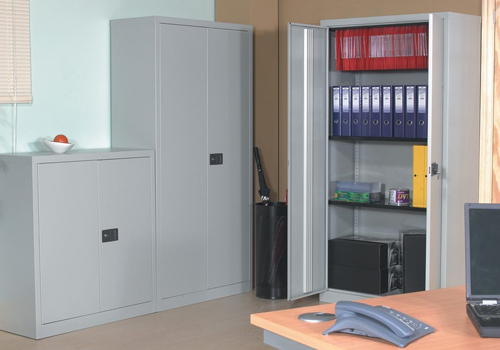 If you’re looking for a storage solution that helps you to stay neat and tidy in the office without compromising on style, steel cupboards are the ideal option. Their minimalist, industrial appearance can help make your working environment look cleaner. Steel cupboards are the ideal choice for those wish to store heavy items or items that are varied in height. Our range of powdered coated steel cupboards are highly resilient and can withstand heavy weights. This is perfect for storing power tools in garages or heavy folders and files in offices. The adjustable shelving mechanism in our steel office cupboards means that you can store items varying in size, offering maximum flexibility. Our wide range means that you can select the right cupboard for your specific needs. Select a size that suits you, from 5 shelves, 4 shelves, 3 shelves, 2 shelves and 1 shelf options. The small steel storage units are perfect for offices who do not have a large space area. These can come with sliding doors, helping you save even more space. Furthermore, the steel material used in our storage units are very easy to clean, making maintenance as easy as possible. When it comes to prices, we understand that you may have a budget in place, that is why we offer a large selection of steel cupboards for sale to try and accommodate for everyone’s different price range. For a cheap alternative, we have a range of second hand steel cupboards for sale. Alongside this, we also have some metal cupboards for sale with a higher price that comes along with more styles and features. Whatever type of stainless steel cupboard you desire, you can be sure to find it in our extensive collection. If you’d like to find out more about our range of Steel Cupboards or discuss your requirements, simply request a callback.